We love this time of year at our Jackson NH Inn and Spa. It feels truly magical to be in Jackson when the air is crisp and there is so much happening. You can return to your childhood with ice skating and sip hot chocolate by a warm wood fire while your little ones spend their Christmas playing in Santa’s own backyard. 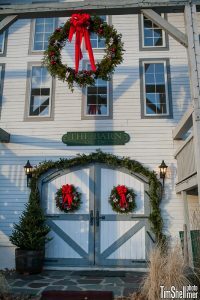 Even beyond what you can enjoy doing on the grounds of our estate, the area is full of Open House events, food and wine tastings, craft fairs, storytelling sessions, tree lightings, rides in horse drawn sleighs, and more. It wouldn’t be late November or December without shopping. The area is rich with possibilities for browsing and buying. From specialty shops near our inn to Settlers’ Green Outlet stores, there are lots of great deals to be found. Make sure you save some room in the back for the ride home! It’s exciting to see children light up with excitement as they wait for their chance to tell Santa what they want under the tree. He’s very busy this time of year, but luckily, he’s scheduled several stops in the Jackson area between now and the big day while his elves work behind the scenes to get ready. Even though Christmas is a great time for family traditions, perhaps your ideal trip to the area doesn’t involve children at all. Maybe you dream of a few days spent looking into the eyes of your significant other, reconnecting on a deeper level. Sometimes experiences are treasured long after possessions are forgotten. Nothing says “you are the most important person in the world to me” quite like a relaxing escape from the pressures of the world to focus entirely on them. Our Romance Packages are built just for that purpose, and we’re actually having a contest to win one of these intimate getaways held between now and January 15, 2015. Whatever else you have scheduled during your stay in Jackson, you owe it to yourself to reserve some Spa time. Trust us, it’s as heavenly as you imagine! You’ll feel positively recharged after receiving a treatment in our AVEDA Concept Spa. We do so much for others during the holidays, it’s nice to take some time for ourselves now and then! If all of this sounds great to you, make plans to join us during the month of December so you do not miss out on any of the fun! We make it easier for you to actually be here during Christmas by offering our guests your 3rd night half off or your 4th night FREE between December 20th and 31st. For Christmas Week, please call reservations at (603) 383-4313 to book. If you would love to be here during December but just can’t carve out some time, you can always leave a hint to a loved one that Gift Cards to Christmas Farm Inn and Spa make great stocking stuffers, sure to generate smiles as you anticipate your ski trip this winter! To see all of our seasonal specials, visit This Page. We look forward to hearing from you!